The Carbon Tracker Initiative (CTI) has come out with a new report highlighting some of the world’s most expensive future oil projects, which the biggest publicly listed oil companies are considering for development. Some of these projects require prices far exceeding today’s levels, and risk wasting $91 billion of investor cash over the next decade if taken into production. The projects are suggested as prime candidates for cancellation. Following CTI’s carbon cost curve study published in May, institutional investors have been asking for more details and economic justification for projects that require high oil prices to succeed. 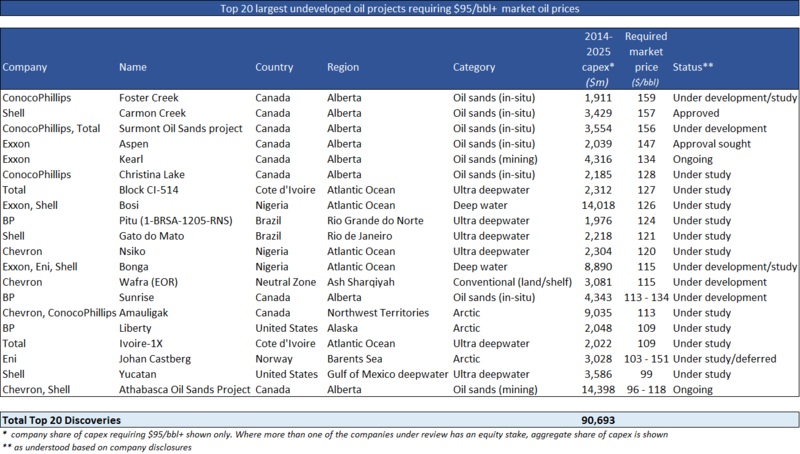 In this new report CTI research goes one step further than the May analysis, ranking oil majors according to their capex exposure to undeveloped, high cost projects, and revealing the highest risk projects. Based on Rystad data, the financial think-tank finds that BP, ConocoPhillips, ExxonMobil, Chevron, Total, Eni and Royal Dutch Shell are considering investing $357 billion over the next decade to develop new production in costly and often technically-challenging projects, ranging from oil sands in Alberta, Canada, to deep water finds in the Gulf of Mexico and discoveries in the Arctic. Both BP and Total are found to have particularly high exposure to deep water and ultra-deep water deposits through 2025, while ConocoPhillips is heavily exposed to Arctic projects. High carbon-emitting oil sands projects account for 27% and 26% respectively of Shell and Conoco’s potential high-cost development spend. Recently, some oil majors have said their capex will either need to fall or stay flat over the next few years to compensate for dwindling returns. In the current, high-cost inflation environment with range-bound oil prices, investors are putting increasing pressure on big oil to re-invest less cash on risky projects and return more to shareholders. Some majors have started cutting already. For example, in the oil sands sector so far this year, Total and Suncor have shelved the $11bln Joslyn project and Royal Dutch Shell put on hold its Pierre River project. Regarding deep-water projects, BP has delayed/ cancelled its Mad Dog extension in the Gulf of Mexico and Chevron is reviewing its $10bln Rosebank project in the North Sea. In the Arctic, Statoil and Eni have deferred a decision on the $15.5bln Johan Castberg project. 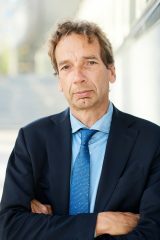 The study aims to alert institutional investors to the risks of investing in projects which depend on sustained high prices to make a return, and that are as a result exposed to a future double hit of falling oil prices and growing climate regulation in an increasingly carbon-constrained world. CTI showed in May that oil prices have collapsed as low as $40 per barrel twice in the last decade, while climate laws are tightening around the world, representing a big gamble for investors. Christiana Figueres, Executive Secretary of the UN’s Framework Convention on Climate Change (UNFCCC), said recently that the world now has 500 climate laws in 60 countries covering 80 percent of global emissions – a trend oil companies can ill afford to ignore. “The responses from Royal Dutch Shell and Exxon Mobil to CTI’s work on stranded assets earlier this year show that these companies have not resolved the contradiction between their acceptance of the need to tackle climate change, and their plans to spend billions on high-risk oil projects at the wrong end of the cost curve”, says CTI. The US Energy Information Administration (EIA) recently found that the oil and gas sector has increased borrowing dramatically to cover spending and dividends. The EIA said a review of 127 companies across the globe found that they had increased net debt by $106bn in the year to March, in order to cover the surging costs of machinery and exploration, while still paying generous dividends at the same time. They also sold off a net $73bn of assets. The new analysis can be reached at http://www.carbontracker.org/site/capex-factsheets-oil-majors.